The relationship between print and digital marketing can feel like a boxing match, each vying for its place at the top of savvy marketers’ minds. Many think digital is the way of the future, but we’ve learned print marketing still matters, too. An effective marketing strategy does not have to be a no-holds-barred fight between the two. Instead of choosing one method over the other, why not combine them? When used together, print and digital can create an even stronger and more innovative marketing plan. Read on to learn how. One of the most common ways to integrate print and digital marketing is to include unique URLs for landing pages in your print ads. Directing your audience to a landing page gives them a clear next step to take to further interact with your brand. The URL should be short and easy to type, so consumers can reach the page easily. After you’ve released your ad, use Google Analytics to track visits to the landing page. These specific, measurable results will show you how successful your ad was. Because you created a unique URL and landing page, you’ll know which views on your site came directly from your ad. If you want to track the success of your message between regions or industries, you can also create different trackable URLs and landing pages for each area. You’ll be able to analyze whether one segment outperformed the others and make changes to cater to each audience going forward. Quick response codes, better known as QR codes, are square bar codes printed on a physical publication which send your device to a digital site. They’re super easy to use: users simply hold their smartphone camera up to the code and follow the link that pops up. 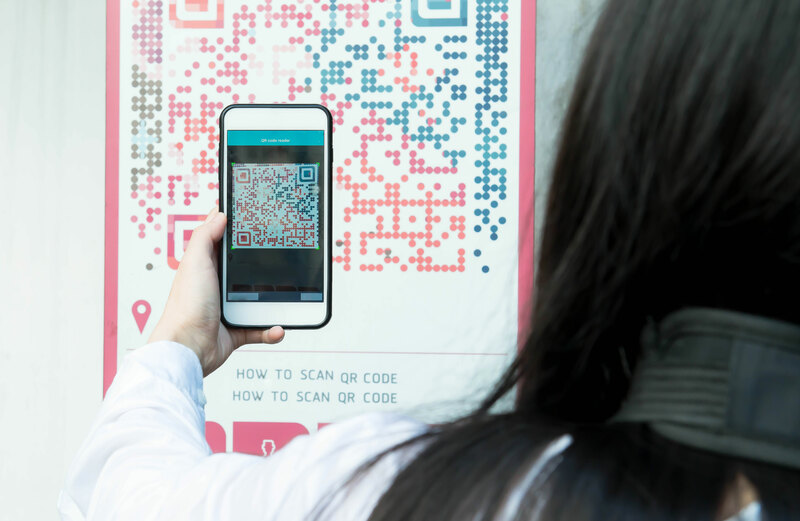 QR codes on advertisements, posters or brochures are a simple and interactive way to direct your audience to whatever online site you want them to see. They are convenient for your audience to use, cost-effective and highly measurable. What more could you ask for? You can select any action for the QR code to trigger: opening a landing page, going to a social media profile or sending the user an email. These actions should help your audience find more information and make a digital connection with your brand. Another way to merge the physical and digital worlds is to utilize SMS marketing and text-to-win contests. You can use promote your contest on any form of media, from direct mail to in-store messaging to your social media accounts. To enter the contest, each person will text a certain message, called a shortcode, to a designated phone number. The winner receives a prize they could use in person or online, like a gift card, coupon or free product. Many brands also require participants to provide an email or address in order to grow their mailing list. One print campaign then becomes more than a one-off marketing tactic; it’s a way to build a strong, loyal customer base. You can continue to use this list of engaged and interested subscribers in the future to get them coming back again and again. Augmented reality, also known as AR, is a technology whereby digital images appear on screen as the audience looks at a traditional print piece through their phone. Snapchat’s facial filters and the popular Pokémon Go app are two of the more well-known examples of AR, but there are limitless opportunities for marketers to use this feature to engage their audience. Companies have used AR to give users a virtual tour of their store or show how a product they view online would look in real life. For example, IKEA has used AR on their website and mobile app to show users what a product would actually look like in their home. Audiences simply select an item, open their camera to show the desired space in their home, and IKEA shows how the product would fit in the space. AR provides the most value when it creates an interactive experience for the user without interrupting their view of their real world. Audiences actually like AR and seek it out because it’s fun, entertaining and feels authentic. An ISACA study found nearly 70 percent of consumers see clear benefits from using AR in their daily life. It provides them with useful information, as the IKEA example shows, and gives added value to their experience. Since it is still a new and growing technology, brands who do use AR create a buzz and make people want to share the ad. For more information on how to combine print and digital, talk with your printer about unique options they’ve seen. Start dreaming about how you will use these two together – the options are limited only by your creativity.